I love the smell of sunscreen in the morning; it smells like victory. 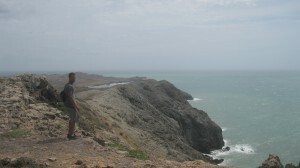 Now, Cabo De La Vela is not your typical Caribbean paradise, lacking palm trees (or really any trees), beach chairs, and most of life’s luxuries. To me though, it is a wild, unfenced desert peninsula, ripe for exploration. My trip began in the crazy, end of the paved road town called Uribia. The arrival of me and my pack sparked a friendly wrestling match between truck drivers, with the victor triumphantly jogging to his rig with me in tow. An exciting ride with occasional stops to drop and pick people up, seemingly in the middle of nowhere. My first night was spent in a small hostel, with a group that I met on the ride in. They consisted of a German man, his Colombian wife, the wife’s friend, and 2 Swiss guys they met a week ago. The fellas all spoke good English, as well as Spanish, so they helped a lot, and once again I felt like a stupid monolingual American. 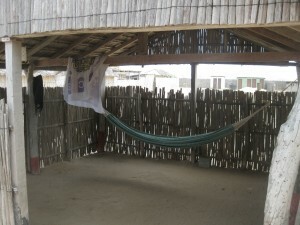 The accommodations were 6 hammocks strung up under a thatch roof, right on the beach. My translators helped procure a ride to see the nicer beaches out of town and a secret sunset spot. Fresh fish was twice cooked for us by the next door neighbor, which was expensive but very good. The group left the next morning, but it was good to do some drinking and socializing. After their departure, I moved to a more gringo friendly hostel down the sand. 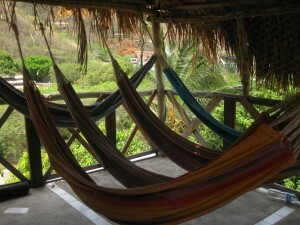 The largest casa around, I got my own “room” with hammock and a friendly staff, none of which spoke my native tongue. Off the beach a little but still a good spot to swing and read. No real showers or mirrors made for a relaxing 6 days of not caring what I looked like, though I did take the occasional picture of myself to see how sunburnt my nose was getting or how wild my salt and sand filled hair looked. As far as activities, for me that was easy once I saw the vast landscape. I made a goal of hiking to the top of every high point and succeeded. Throw in a cool salt flat, nice beaches, and a dramatic coastline, and I wore myself out. I alternated hiking and reading days, always with a healthy dose of salt water. A typical hiking day started at 9 am with a general direction. I looked for sticks to protect myself from a possible sheep/goat attack, because I know that one day all livestock will rise up against their human oppressors and just want to be ready. We gave each other enough space as I made my way from one pinnacle to the next. My favorite stretch was along the northern coastal ridge-line, dropping some 100 meters straight down to the waters below. These are my ideal hiking conditions: 360 degrees views unobstructed by trees, gradual ups and downs, wind cooled, ocean views, changing rock formations, swim breaks, and all to myself. The other positive aspect of Cabo is the type of travelers it draws. Not a party destination though it is a kite surfing spot, I met some laid back blokes. With only about 15-20 gringos in town at a time, I often saw the same few people wandering around and exchanged the usual hello. One night a group of 3 outgoing British girls moved in next door and we joined with another group of 3 (a Dane, a Deutchlandian and his UK girlfriend; all kiters) for some drinks until our servers wanted to go to sleep (10pm). Always good to hear from people on the same path. There were still a few hawkers roaming the beach, but as opposed to the bigger cities, they were all soft spoken indigenous women. I decided to purchase myself one of their bracelets, thinking that it could serve as sort of a wedding ring, letting them know that I have made my decision and am off the market. Though I did not take into account the opposite effect. Apparently, a man with a bracelet is a more attractive customer, showing that one is willing to go all the way. Initially, I took offense to the notion that I look like a multiple bracelet type of guy, and that they thought I could juggle 2 or 3 at a time. But I had to consider the practical applications of having alternate versions. Maybe one day I get tired of my first bracelet, after time has taken it’s toll or it is tragically lost while swimming. At that point, I would be happy that I had one on the side, so that I wouldn’t have to go back out there and play the game, especially if I am advanced in years. Thus, I must admit that I picked myself up a 2nd one that is a slimmer version of the first. 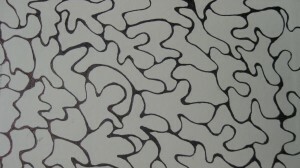 I think it will look better on my arm in the more hip, metropolitan cities like Medellin and Cali. By the end of my 6 days, the desire to shower was high, mass amounts of Colombian tourists were arriving for the holiday weekend, I had finished reading “Crime and Punishment”, and my shoes were falling apart: I was ready to leave. Awaken at 4 am to catch the truck back to civilization, I left a small bag of batteries and forgot to latch my luggage lock, which is now in the middle fo the desert (sorry Dad, it was yours). 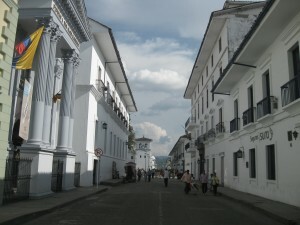 After 14 hrs of transit, I am now in Cartegena, a beautiful walled colonial city by the sea. A few too many ritzy tourist cafes and shops, a little too hot, and a little too expensive, but overflowing with street food: I am spending 2 nights here before another long haul down to Medellin. Agua salada adiós, hasta que nos encontremos de nuevo. Checking in from Riohacha, a nice quiet city with a huge windy beach: I figured since I haven’t been doing all that much the past couple days, I would use this time to post about what I have been putting into my mouth. I touched on it a little last post and feel the need to elaborate. I apologize for the lack of pics, this computer doesn’t seem to like my camera. Let’s get started. With my early physical exercise and now draining heat, liquids have been consumed in mass quantities. Agua, or water to you guys, is not as cheap as I would desire, thus I have been toying with the multiple ways it can be purchased. I began by buying the normal 600ml plastic bottles, that range from 75 cents to $1.25. After seeing how fast I went through them I tried some other forms: 5 L jug which works for extended stays, 1.5 L bottle which is a little big for my day bag, and now the various sizes of water in a bag (similar to ice packs). The bag version is very cheap but must be transferred to a bottle to be portable. So, as you see, I have put a lot of thought into my agua consumption that I believe will help me throughout my entire trip. Other liquids consumed are: The occasional cerveza (beer, cheapest styles are Aguila and Poker), Gatorade (a little expensive, but if you believe the ads, a necessary luxury), Jugos (fruit juices, such as lemonade or the rare smoothie con leche), and various flavors of soda (Orange is my favorite, I am similar to the Waponi in that way). Now to the solid stuff: Trying to keep my costs down, I have sought out street food more often than a sitdown restaurante. 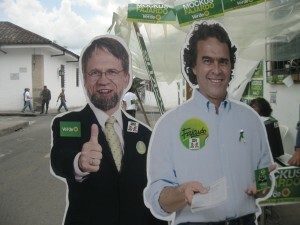 The result has been a somewhat negative view of the food here in Colombia. While I still feel like the food in general here is below par, I have softened my stance a little over the past couple days. On Saturday in Santa Marta, I hit up a small place that was recommended by Lonely Planet. Serving only Ceviche, they do it extremely well. I orderd the 10 oz Combinado, which contained shrimp and other unknown fish, served in a white dixie cup with saltine crackers. I knew by the hord of locals sitting out front, silently spooning out the contents of their cups, that it would be good and it truly was. I walked mine down a block to the beach and sat there feeling ashamed for blasting this country’s cuisine without giving it a fair shot. In hindsight, the $5 cost of my dinner was worth it and now I will allow myself to indulge every now and then. I have since sampled another ceviche stand and today sat down for an almuerzo ejecutivo (loosely, a set meal), which included some fish soup and a plate with chicken, rice, beans, and salad. With the quality and availability of empanadas declining here on the coast, I see my palate expanding with hopefully positive results. The fast/cheap foods that I have been putting down have mainly been of the fried variety. Empanadas, with my favorite being the pollo con arroz (chicken with rice), is still the favorite of the fast stuff. Another one I enjoy is like a beef stew wrapped in a fried bread ball. Very hearty, with mashed potatoes and corn. An Arepa is the last of the fried stuff that I will acknowledge, it’s a flat corn tortilla like bread often filled with a fried egg, a good breakfast. I have sworn off the chorizo for a while, which normally was served with potatoes, due to some unenjoyable texture and suspect content. Pizza has been tried twice, with last nights being quite good. A Hawaiian style that actually had a decent crust. They sell hamburgers a few places but I have yet to attempt since they are overpriced. Though I did try one hotdog wrapped in bread like a corndog, with positive results. Overall, I guess I would say that I am mostly just disappointed with the quality of the cheap street food and that if you fork over a little more, you can get some decent grub. I will admit it, I have been spoiled in many ways the past year: The rooms that I have stayed in here have been too nice. My skin has generally been dark enough that sunscreen isn’t necessary. Thailand’s seas were too clear and the sand was too white. Thai food tastes too good and costs so little. Thai people spoke too much English. 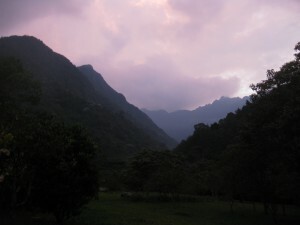 And Machu Picchu, last summer, was too spectacular. All of that is now having it’s effect on me in Santa Marta. As I strolled onto a Caribbean beach, for the first time in my life, my eyes immediately checked the water’s clarity. I can’t help but compare it to the other tropical beaches I have been to (all in Thailand) and be disappointed. I know it is not fair, especially since the city I am in is rather large, but it’s what I did. Now, that doesn’t mean that I didn’t enjoy swimming and laying out and burning myself, cause it was a blast. But my heart still yearns for more tranquility and beauty. I went looking for the later in Taganga. Known as a “Gringo Paradise” and growing Caribbean party destination, I knew that Taganga would not meet all of my needs. My goals were to see the beaches nearby and get in a little socializing. The water was decent but the sand was not as soft as I like it (remember I already said I was spoiled). A few too many rocks, broken bottles, and peddlers on Playa Grande, a 20 minute hike north of Taganga. Though the deep cove and surrounding desert hills provide some nice scenery. I cruised back into town to check out the sunset and get my grub on. I have sampled nearly all of the cheap cart offerings and am somewhat disappointed. It’s actually a little hard to find easily accessable empanadas and the ones I have found near the beach were below par. This is one area where Thailand has Colombia dominated. That night I opted for some breadstick thing with a little cheese inside and what I believe was a polenta paddy filled with chicken and salsa (lacked flavor). My accommodations that night were in an American owned hostel. Run by a couple from San Francisco with a 20 week old son, the place had a great feel with scenic roof top bar. I met some fellow travelers and had some beers at the casa before we cruised down to the beach. An interesting scene, with random groups of gringos about, drinking/smoking/ or playing instruments. Loud music from nearby discos is heard and like us, it is possible to be frisked by a policeman while sitting in the sand. Back at the crib, I unsuccessfully attempted my first night in a dorm hammock arrangement. No sleep was had, due to loud strong winds and awkward positions. Many of you may know that I have trouble sleeping on things not called beds. Especially in transit like planes, trains, and automobiles. I mostly chalk it up to physical pain when not lying flat and anxiety about travel, maybe there is something wrong with me, who knows. Anyways, I knew I couldn’t spend another sleepless night there and felt that I had seen all that this pueblo had to offer. Thus, I am back in Santa Marta. I have my same, semi-comfortable room, at Hotel Titanic and am content here. The beach has sand and is under the sun, which is helpful, and the street markets are the most vibrant I have seen. Today I purchased myself a pair of sandals ($5, left my beach ones at home), snorkel mask and tube ($8, should be useful), and sunglasses ($4, I broke the ones I had and tossed ’em, but they belonged to H4, so no worries). 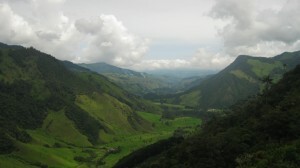 Most tourists in this area go on a 6 day trek to Ciudad Perdida, or ¨The lost city¨. It would be fun, but with Machu Picchu under my belt, I feel like the $300 cost would not be worth it. Though it would fit in with my theme of journey over destination. 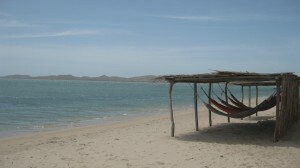 The current plan is to spend another 2 nights here before attempting to get to Cabo de la Vela. Should be a little tricky but rewarding. Hasta los confines de la tierra! After a long 24 hrs of transit, I finally made it to the beach. The day was full of mildly interesting events and I did some things that made me feel good inside. People may say I was almost Christ like, though I wouldn’t say that. It started with a language barrier induced misstep. After consulting with the touristica informacion, I believed that the buses to Santa Marta left at a semi regular basis beginning in the AM. The lady said ¨Ocho, Nueve, Diez, ... ¨, thus I aimed for the 9am departure. The taxi driver to the terminal was a little skeptical and walked in with me, helping me discover that they don’t leave until noche (night). He drove me down to the other station so that I may at least get started going north to the next town (Buca), 2 hours away. I made a poor seat choice for this trip, which has become very common for me. Being a tourist, I feel that I should take the least desirable seats, especially with most of the other passengers being from the older generation. Choosing the back left seat presented a few problem: They are raised up about 18 inches and when the riders in front reclined, my leg room was nada. To look out the windows, I have to wrench my head down to my knees. But the biggest regret was missing the views, out the right side, of the Rio Chicamocha canyon. The glimpses that I did catch were stunning. While we were passing the crevase via some curvy roads, a little girl next to me sitting on her mother’s lap, began to feel ill. Luckily she was able to acquire a plastic bag in time to for la niña to let it fly. I offered her some of my unopened water, but she graciously declined. Upon my arrival to the Buca bus station @ 11:30am, my fears were correct when I was told that the Santa Marta bus didn’t leave until 9:30pm. It was a nice enough terminal, with outdoor seating and plenty of empanadas. Random people sometimes sat near me and tried to have some type of conversation. I always smiled and tried to find a time to jump in and tell them¨No entiendo, no hablo español.¨ A young boy who wandered over seemed confused by the fact that I didn’t speak Spanish, and after a few moments of silence, sweetly waved and said ¨Ciao¨. The most interesting locals, were a husband and wife who strolled over after it got dark. They seemed from the Caribbean area, with darker skin and creol accents. The lady attempted to teach me some things, by talking slowly and not giving up until I gave the correct response. I later impressed her by saying ¨No tengo tiempo¨when she asked me for the time. The phrase was one I had memorized and felt appropriate though it was a lie, because I had just checked my clock. My suspicions that they were homeless were confirmed when she saw me in the terminal and told me they weren’t heading anywhere. I bought her a beverage and let her walk down another stall or 2 to get someone to buy her food. As she successfully strolled back with fried stuff in hand, I received a victorious fist bump and a smile. The 11 hour bus ride was slighly eventful as well. With my back left seat secured, I realized that I was going to be on unofficial el bano patrol. The door was tuff to open and close, which provided me with some enjoyment and concerns. I would hear a lady struggling with the door, open my eyes, and then reach over and give it a tug. But my job was not finished, they still have to get out. Most found the strength but I still kept my ears alert for the sound of knocking or the cry for help. It was a difficult job, you have to be sure that they are ready to come out and that you are not just hearing road noise. A premature door opening would be devastating. The fearful ones would not even close the door all the way, causing it to fling open at all minor bumps. Luckily, I had no view in and just giggled everytime. I helped one old lady and listened for her exit call, with my eyes closed. I never heard it and feared that she may be trapped in there the rest of the trip. Maybe too shy or weak to knock loud enough, she would wait for a rescue from the next user. I was relived to realize she had made it out without me knowing and tried to get some shuteye. I am taking full advantge of not having time constraints. My 2 night stay here in San Gil has turned into 5. After the initial downpour on my first night, the weather has been perfect. I have been able to do as much or as little as I want. 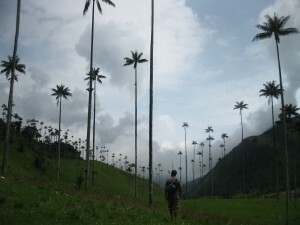 Thursday: I strolled through “El Parque Natural el Gallinera”. 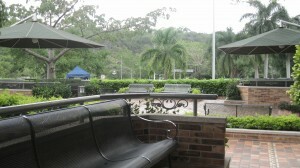 A beautiful, quiet park, set on triangle shaped land at a fork in the river. Lots of green stuff to look at, but the most impressive was the “Old Man´s Beard” that hangs from nearly all of the 1,800 trees. 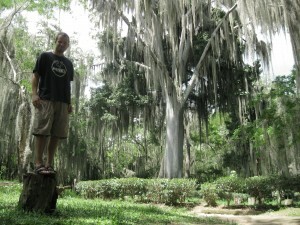 My favorite spot was near the massive tree seen in the photo below. I sat there for over an hour, only seeing a gardener. As I walked around the place, I saw my first Colombian snake (Brownish, small head, about 1.2 meters long). Also saw a lizard on a rock near a creek. I approached in an attempt to capture his image in digital form, but he ran away on top of the water. Kinda cool. 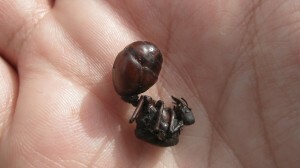 After the park, I sampled the local treat called “Hormigas Culonas” or as we know them “Fat-bottom ants”. They are fried and actually quite tasty. 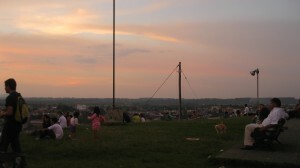 I took my snack up to a high place called “Cerra La Gruta”, where there is a shrine and great city/valley views. Plan is to head up there tonight for sunset. Friday: A day trip to Barichara. Quaint, picturesque village sitting above a valley. I hiked the 2 hr cobblestone path down to an even smaller pueblo called Guane. Sometimes scared of the goats and cattle grazing unattended in my line. More desert like, dry and hot. Cactus around me and I drank lots of liquids. Feeling a bit parched the past couple days, when I got back into San Gil I purchased a 5 liter jug of water to keep in my room. Turned out to be a great money saver. Saturday: Didn´t really do much. After lunch, I sat in the park for over 2 hours and read “Crime and Punishment” while the locals did what it is that they do. I was able to get through the crime part of the book, but I am not as much of a fan of punishment, so we shall see how it goes. That was my cheapest day so far, totaling about $14.62 USA money. 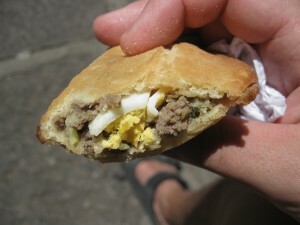 I have been consuming a good amount of Empanadas, due to the price and portability. The varieties have been: Chicken and rice, beef and egg, or chicken rice and egg. At first, I was ashamed of taking the easy way out so often but now I plan on embracing it and putting my empanadas out there for everyone to see. New to Micah:Unmitigated, “The Empanada Count“. I am not sure yet how I will display it (H1, any suggestions? ), but for now I will just say: E = 14. I think that 200 is a reasonable goal for the trip, with 300 even within reach. I know you all will be glued to your computer, mobile device, or Ipad.